Centara Grand and Bangkok Convention Centre in Bangkok is anticipated to reopen on 1 June following repairs to the hotel damaged by arson during last week's political unrest. 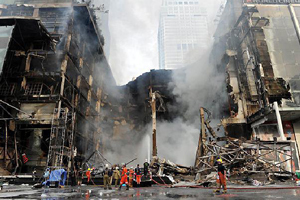 Centara Grand and Bangkok Convention Centre is situated in CentralWorld mall, which was badly damaged by fire last week as political unrest in the Thai capital reached a violent conclusion. Centara Hotels and Resorts director of group marketing communications Kanokros Sakdanares said: "We are relieved to announce that the Centara Grand and Bangkok Convention Centre at Central World remained generally unharmed by the recent events, with smoke damage being the major issue for the facility." The hotel and convention centre are undergoing "deep cleaning for several days" before the Bangkok Metropolitan authority gives approval for their reopening. "Certain areas of Central World such as the Zen department store suffered severe damage, nevertheless, the main Central World building annexed to the hotel suffered only minor damage," said Sakdanares. "The Bangkok Municipality has cleaned public areas and roads leading to and from Ratchaprasong intersection." Meanwhile, the Foreign & Commonwealth Office's (FCO) continues to advise against all travel to specific parts of Thailand, including Bangkok, and all but essential travel to other specific parts of Thailand. There are plans for the British Embassy in Bangkok to reopen and offer a limited public service today.